Caterina Edwards was born in Wellingborough, England. When she was eight her family emigrated to Canada. Her mother was from Venice, Italy, and her father from a Welsh and English family. She grew up in Calgary and later attended the University of Alberta in Edmonton where she earned a B.A. in English. She went on to complete an M.A. in creative writing, working with Rudy Wiebe and Sheila Watson. She soon began to publish short stories in literary journals, and anthologies, a varied production which has continued to this year. With the publication of her first novel, The Lion’s Mouth, in 1982 Edwards became the first Canadian writer to explore the life of an Italian immigrant woman in Western Canada. As her bibliography demonstrates it has been the subject of many critical articles and theses. In 1986 her first play, Terra Straniera, was a success at the Edmonton Fringe Festival, and has later published as Homeground by Guernica Editions. 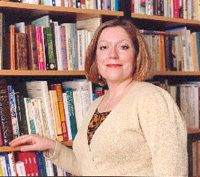 In 1992 Edwards brought out her novellas, Whiter Shade of Pale/ Becoming Emma, and edited Eating Apples: Knowing Women’s Lives (1994) with Kay Stewart. During her active writing career Caterina Edwards has also been teaching creative writing and English at the University of Alberta, Grant MacEwan Community College and Athabasca University. See the bibliography of her works.